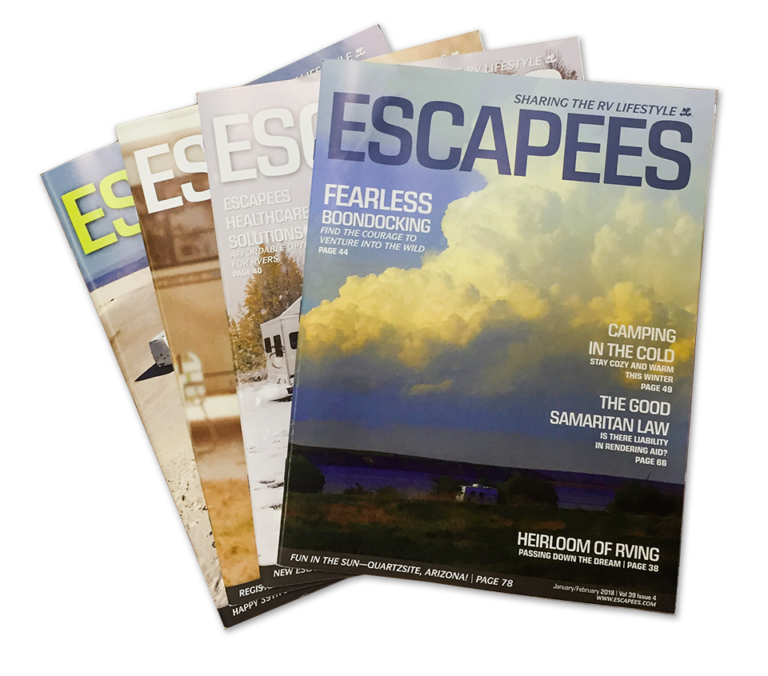 Our bimonthly Escapees magazine is 88 pages packed with useful, entertaining, and specialized information on all aspects of RVing. You will find technical tips, RV maintenance information, safety education, advice from full-time RVers, unique boondocking, and off-the-beaten-path locations, products reviews, and much more. Special notices of club-related events, outings, and community celebrations are also included. With a lower-than-average percentage of advertising, members tell us they acquire more useful information from our publication than they do from any other RV magazine. Escapees RV Club has accumulated over 35 years of the best articles and information regarding the RV lifestyle through Escapees magazine. We have an online archive dating back to 2006. You can view the current issue, or a favorite past issue, here on our website. Download a PDF copy or use our online Flip Book. Our mission is to provide you with quick and easy access to this tremendous volume of educational material in whatever format is the easiest and most convenient. I've been an Escapee so long that I remember when the magazine was the newsletter stapled together. I had forgotten about that until I caught it in an old magazine that I picked up at North Ranch in Congress, AZ. Thanks again for everything we that we've learned. I still read the magazine from cover to cover. Most of the time I learn something new...or at least refresh my memory about something that I had forgotten. I download every one of them. Love that we can do that, especially when I'm in another country and won't get our mail for four or five months. Special notices of club-related events, outings and community celebrations are also included. With a lower-than-average percentage of advertising, members tell us they get more useful information from our publication than they do from any other RV magazine. Members have access to our online archive dating back to 2006. You can view the current issue or one of favorite issues again right here on our website. Download a PDF copy or use our online Flip Book. Our mission to give you quick and easy access to this tremendous volume of educational material in whatever format is easiest and convenient for you. Escapees RV Club members may order current or back issues by calling 888-757-2582. Please direct any questions or inquiries regarding the magazine to editor@escapees.com. Interested in contributing to Escapees? Club members are encouraged to submit articles and photos for publication in Escapees magazine. Visit the “Submissions” section to find out how.